The Wind Ensemble comprises of the University’s most talented wind and percussion performers, most of whom are majoring in music. With its home in the University’s beautiful Ferguson Center for the Arts, the Wind Ensemble performs three major concerts a year in addition to performing at special events and ceremonies. The ensemble frequently works with guest composers, conductors and soloists, providing the students challenging repertoire and immersing them in cultures and performance practices from around the world. The Wind Ensemble's repertoire reflects the standards and expectations found in the world's top music schools and conservatories, and ensemble members enthusiastically embrace their responsibility to the music and to each other. In essence, the Wind Ensemble plays several concerts of challenging and sophisticated repertoire, supports the major events of the University, and does all of this with very limited rehearsal time. The educational purposes of Wind Ensemble are to challenge the University’s most advanced music majors, to promote the high musical standards of the department, and to recruit serious and talented music majors. Students can register each semester, but no more than eight credits can be counted toward graduation. Auditions are held each semester to ensure that the members are on top of their game. 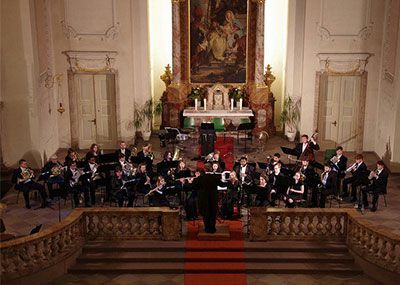 The Wind Ensemble performed as the "featured ensemble" at the Estonian National Wind Band Competition in 2014, at the Estonian Academy of Music and Theatre in Tallinn, Estonia's largest and most prestigious higher education performing arts institution. Please e-mail Elise Rose (elise.rose@cnu.edu) to obtain your part of the prepared work. Also included will be major scales and sight reading. The Wind Ensemble is a highly visible ensemble that performs approximately once a month. The musicians in this ensemble must be excellent sightreaders, learn music quickly, have strong musical skills and have a voracious appetite for new music. Rehearsals are Tuesdays and Thursdays from 4:30 - 6:20 p.m.
Devroye, Pascal What an Event! Rudin, Rolf . . . bis ins Unendliche . . .
Schwantner, Joseph In evening’s stillness . . .
Whitacre, Eric Godzilla Eats Las Vegas! Zaninelli, Luigi Five American Gospel Songs for Soprano and W.E.